This is a spinning wheel of considerable vintage. Likely pre-Victorian. It came from the estate of a couple who collected antiques from Europe and the British Isles. The estate sale managers were trying to sell the wheel itself and the alternate flywheel separately, describing it as an "extra wheel," and speculating that someone might buy it as a decoration. I urged them to sell the wheel and the alternate flywheel together, because they are a set, and it's bad enough that the treadle and footman are missing, along with some other parts, but to sell the alternate flywheel separately would completely degrade any remaining value on the wheel. It was priced a bit out of my range for speculative purchases, but no one else bought it, and the seller is warehousing it for at least a few weeks. That will give me time to consider whether it is worth purchasing, with a goal of restoration in mind. According to the references I have inside my head, in books at hand, and what I could find on the Internet, I think this is likely a Northern European wheel. Spindles, treadles and footman are missing. However, there are two flywheels, and they are easily interchangable, turning smoothly once inserted into position. One flywheel is heavier than the other by at least eight ounces. having a stouter rim, a larger hub, and stouter spokes. So my guess is that this wheel was likely used both for linen and woolen production, and the flywheels interchanged as needed. Each flywheel has an iron axle on one end that sets into the frame, and on the other end, the axle rests in a slot on the frame, with the crank (a curved piece of wrought iron) extending beyond the frame to meet the footman. If the footman were there, that is. In all likelihood this was originally a spindle wheel, and not a flyer wheel. Although at first glance the upper mother-of-all sits perpendicular to the frame, if you click on the picture to make it larger you can see that it easily rotates to the right or left, because it actually screws onto a vertical wooden screw shaft. It rotates easily in this position. The screw mount is raised and lowered by a carved thumb nut, which sits directly atop the wheel frame. This upper mother-of-all may have sported a flyer at some time. What puzzles me is that there seems to be no means to firmly secure the upper mother-of-all in a position perpendicular to the wheel. Is a part missing, or was it secured in some other manner? There is a second mother-of all mounted lower down, in the form of a horizontal wooden bar that rests within grooves above the flywheel inside the frame, and the maidens sprout from this bar, pointing toward the spinner. This bar is attached to the vertical wooden screw shaft, and is raised and lowered by means of the thumb nut atop the frame. The screw shaft continues upward, and the upper mother-of-all screws directly onto it. The lower maidens appear to be set up for use with a spindle. It looks like it held a spindle with a very small whorl -- I think that is called a "bat's head" whorl. It rests in such a position that a spindle could have been extended out to the right, using this mount, while the upper mother-of-all was positioned with the working end to the left, and two people could have sat on a bench next to one another, spinning simultaneously. One side of the frame base is shorter than the other, which also puzzles me, unless it was made that way deliberately so someone's foot could rest there -- either the right foot of a spinner treadling with her left, or the feet of someone sitting next to her, spinning off the lower spindle. It also occurs to me that the upper mother-of-all could have been added later as an update, to support a now-missing flyer. That does seem to be the case -- the upper assembly is a different type of construction and a different wood has been used. Some clever person may have designed this to screw directly onto the existing screw shaft. Overall, this wheel is in fairly good condition, however, the wood is so old it is actually somewhat soft in places. There is no apparent insect damage. Just age. I was a bit frustrated because somewhere in the past I had seen a reference to a very old castle-style wheel, similar to this one and also with interchangeable flywheels, described as a "weaver's wheel," but for the life of me I couldn't recall the reference. While Googling for information on this particular wheel configuration, I stumbled across a public domain photo of a painting by Victorian artist Marianne Stokes, a native of Austria. The painting is entitled, "St. Elizabeth of Hungary Spinning for the Poor." 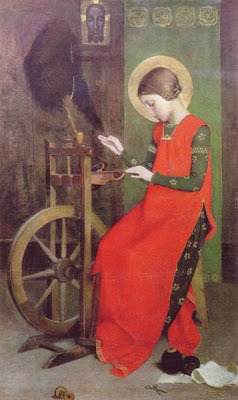 I learned that St. Elizabeth lived in the 1200s, and for about eleven seconds I got all excited and said, "holy cow, an 800-year-old spinning wheel!" But almost immediately I realized that a Victorian painter likely would have used a spinning wheel readily at hand for a prop, rather than try to obtain an authentic six-hundred-year-old wheel to add authenticity to the painting. Most young women at the time would have been reasonably competent spinners, so the artist could simply have seated a young woman in medieval costume and hairstyle at the nearest wheel and told her to spin. No doubt a good way to make the model sit still for awhile, too. So. Almost certainly not a medieval wheel, but it's likely to be circa 1850 or perhaps a lot earlier. The painting clearly depicts a spindle wheel, with an interesting distaff attached to the top, but the construction is very similar to the wheel I found. I suspect that the artist painted the wheel in still life before seating her model and putting her to work making yarn. I told the seller of this wheel that I was interested but it was more than I wanted to pay for a wheel missing critical parts, and he said he would consider a lower price. I think it would be a real thrill to obtain and restore a truly antique wheel. So that's the extent of my sleuthing. Ideas or input, anyone? Surely there must be someone -- probably several people -- among my readers with a firmer knowledge of spinning wheel history than my own. I'm sorry I don't have a clue as to the historical side of wheel production, but thank you so much for sharing your photo & observations of this mystery wheel! I have a weak heart for broken tools and instruments, so who knows what I might someday come across myself? I'm very interested in seeing how this plays out for you! In The Alden Amos Big Book of Handspinning there's a very similar wheel illustrated on page 190. The subtitle labels it a vertical-frame Swiss wheel. Interesting Dez. I was given a spinning wheel recently. It looks verr similar. As I do not spin it is not much use to me but I know someone who does so, when we can find a way of getting it there, it is going from Australia to Germany. My father, who knows something about woodwork (a lot about woodwork! )but nothing about spinning says it has to be well over 100 years old. Two spinners assure me that it can be used for spinning silk but it only has a single wheel so your find sounds even more intriguing. This one is apparently complete and, they said, "beautifully balanced" - wish I had time to learn to spin.